This is Linda Tucker’s firsthand account of her journey into the mysteries of the most sacred animal on the African continent: the legendary White Lion. This book reveals the knowledge and ceremonies of Old Africa and the overwhelming love that has driven her every action to save these magnificent beasts, against formidable odds. . . .
After being rescued from a life-threatening encounter with lions in the Timbavati game region by a medicine woman known as the “Lion Queen,” Linda embarked on a journey into the mysteries of the White Lion. It is a mystical journey into the knowledge and ceremonies of Old Africa, in which humans and lions are able to cross the species barrier—in accordance with the most guarded secrets of Ancient Egypt and humankind’s greatest riddle, the sphinx. Scientists in our day have established that humankind’s most significant evolutionary leap occurred as a result of our ancestors’ interaction with great cats. The White Lion is a genetic rarity of Panthera leo, and occurred in just one region on earth: Timbavati. Today White Lions form the center of the notorious “canned” trophy hunting industry—hand-reared captive lions, shot in enclosures for gross sums of money. By contrast, shamans believe that killing a “lion sun god” is the ultimate sacrilege. How the human species treats such precious symbols of God in nature may determine how nature treats the human species. 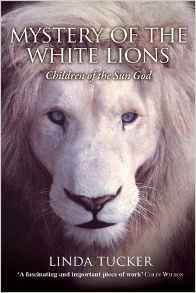 Whether we view them as prophetic “Lions of God” or simply as rare genetic mutations, the story of the White Lions is a true legend unfolding in our own extraordinary times.